I still remember how much it struck me when I realized this was false. You are a body. 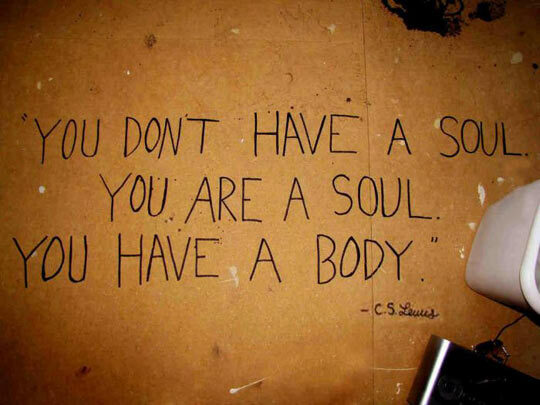 You don’t have a body and a mind and a soul, you are your body. All of the activity that feels like not your body is from your brain. Neuroscience is really interesting! That’s all I have for right now. I’m trying to finish my review of I Don’t Have Enough Faith to Be an Atheist, as you can gather from my twitter feed. It’s already quite long, and I think I’m going to post it as a separate page rather than a single post. When that’s done, I’ll blog a notification, and it’s so long that I probably won’t post anything else for at least a week. Otherwise, I couldn’t expect anyone to read it! I always found quotes like this to be really trite. Dan Dennett would call them “deepities” and explain how they have the appearance of being deep without actually saying anything. Functionalism is very convincing if you know enough about the arguments. They’re hard to follow–very esoteric, and I’m certainly not smart enough to distill them into simple points. I think that theists or dualists have a long way to go to try to explain how the soul matters when the evidence seems to indicate that the mind is an emergent property of the physical brain. It’s not something you can ignore or sweep under a rug, and gaping it (as in, god-of-the-gaps) isn’t sufficient anymore. Yes, that. I am normally a bit more articulate and better at presenting evidence for my conclusions, but I was pretty distracted trying to get this review together so I could post it this week.